Borders come in all shapes and sizes…From huge international ones to tiny ones inside a person’s head. Gordon Southern brings his unique perspective to the mountain ranges, rivers, rabbit proof fences, state lines, city limits, airport passport controls, lines in the sand, boundaries of good taste and of course the ‘fourth wall’ that he gleefully breaks down with his engaging, spontaneous style. Gordon is rapidly becoming known for his unique style which mixes intelligent analysis of global events and phenomenon with very silly and personal observations, all packaged within a neat narrative. “..a pleasure from start to finish..” – Adelaide Theatre Guide, March 2010. “Gordon Southern delights with his new show ‘Borders’” – Kryztoff Fringe Raw, March 2010. 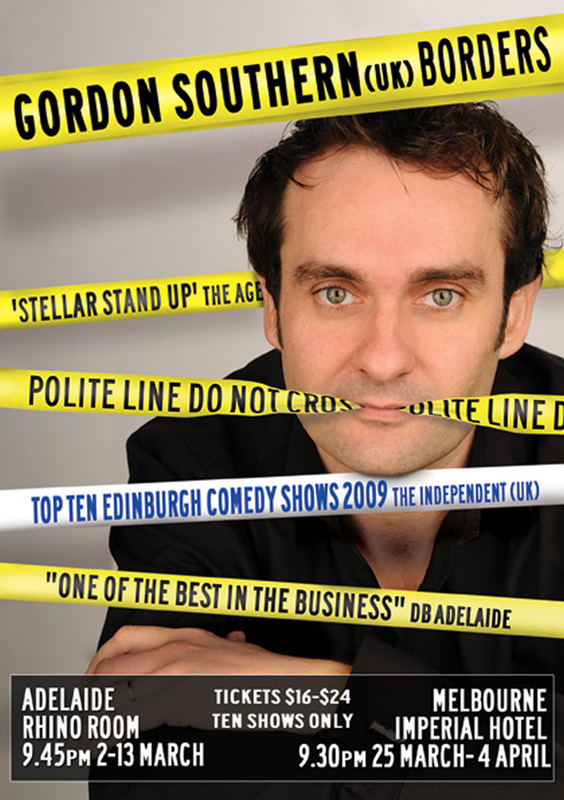 “This is the fourth Fringe show from the solid Gordon Southern I have seen and he never disappoints” – Chortle, Edinburgh Fringe – August 2010.